Well, I'm working on a project where I enable a user to upload a file and store it in SQL Server 2005, and then need to pull it out of the database and save the PDF file to disk using a WinClient app. System.IO.FileStream fs;                // Writes the binary to a file (*.pdf). System.IO.BinaryWriter bw;              // Streams the binary to the FileStream object. int bufferSize = 100;                   // Initial size of the binary buffer. byte outbyte = new byte[bufferSize];  // The binary byte buffer to be filled by GetBytes. long retval;                            // The bytes returned from GetBytes. long startIndex = 0;                    // The starting position in the binary output. string rec_id = "";                     // The id to use in the file name. // Create a file to hold the output. // Reset the starting byte for the new Binary. // Read the bytes into outbyte and retain the number of bytes returned. // Continue reading and writing while there are bytes beyond the size of the buffer. // Reposition the start index to the end of the last buffer and fill the buffer. // Write the remaining buffer. // Close the output file. Attended the Windows 7 and Server 2008 R2 launch party in Atlanta today. It was interesting to see the sensor demos so I thought I'd post a quick note about it if anyone is interested. Have you ever used a test program to simulate a Brute Force attack on your login screen? It's pretty vicious and cool at the same time. On my login screens I've developed for public access I perform the following to help block any Brute Force attempt. 1. Implement Captcha technology after 3rd failed login attempt. 2. Lock account after fifth failed login attempt (optional). 3. Implement a random delay using System.Threading.Thread.Sleep on each failed login attempt. Of couse, all of this may not be 100% attack proof, but is sure complicates things. //Randomly delay request, I use anywhere between 2 and 20 seconds. I have finally finished it (back in February). 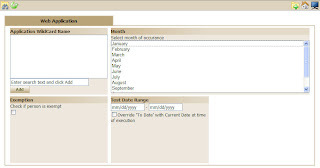 It is used for both filtering data and filtering report criteria. A little history on my project.. I've worked on 2 similar projects in the past. 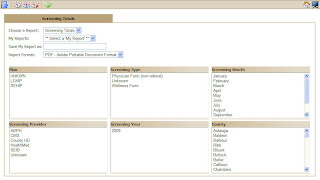 The first was a database driven filter screen written in classic ASP and simply provided a stacked layout of different controls and a simple listing of results with hyperlinks to edit details. It was precise and functional, but not expandable to include reports or reuse elsewhere. The second, my previous job, was class driven and cumbersome to develop against, to say the least. It generated only list boxes and a full page of results - thus it had no paging or reording abilities, but had a nice flow layout. Since I started a new job I decided to start on my own generic filter that borrowed the idea of a database driven backend and various control types, and a flow layout (using DIV tags instead of tables) and threw in a slew of other enhancements. Here is the results screen, notice it uses paging and sorting (took a while to figure that out since my gridview isn't bound). 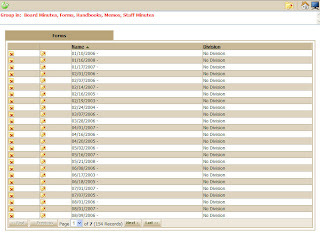 Here is a screen shot of the Reporting filter, it allows saving and scheduling of reports and more. Thought I would share a little JQuery code. I finished my dynamically generated filter screen a few months ago and when I did the layout I decided to dynamically generate DIV tags instead of TABLES. I basically had 3 types: small, medium, and large columns that floated left with a maximum of 3 small columns per row, 2 small and 1 medium, etc.